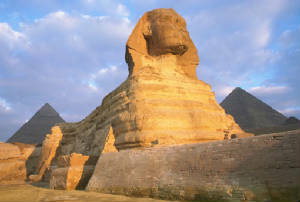 Egyptologists have long believed that the head of the Great Sphinx was intended to be a likeness of the pharaoh Khafre because of the proposed dates of its construction, the use of the royal headpiece and its physical relationship to Khafre's pyramid. However, in 1996, a NY detective and expert in identification, took various measurements of the size, angles and proportions of the head and concluded that it did not match known representations of Khafre's face. There was a greater resemblance to Khafre's elder brother Djedefre, however the lack of any records regarding the head leaves us in a bit of a quandary. It is possible, but not likely, that the Great Sphinx was given a generic royal head. Guardian's Sphinx site (links below) has a facial comparison showing the Sphinx, Khafre and Djedefre, though comparison is difficult without seeing several angles in detail. You can tell by examining some of the photographs that the head of the Great Sphinx is relatively small in relation to the lion body, which is otherwise in correct proportion. Possible explanations could be that the head has been re-carved one or more times since the first image was constructed. A subsequent pharaoh, or pharaohs, may have preferred to see his own likeness, or perhaps the original head was that of a ram or hawk and the shape left insufficient material for an accurate facial rendering without reducing the size of the head even further. Repairing damage to the head over thousands of years might have necessitated reducing or altering facial proportions. All this could account for the small size of the head in relation to the body, particularly if the Great Sphinx is older than traditionally believed. 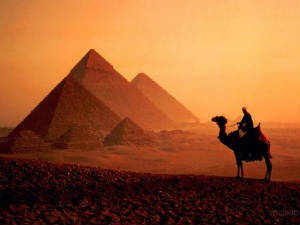 The pyramids of Giza are perhaps the only true rival to the Great Sphinx when one thinks of ancient Egypt and its architecture. 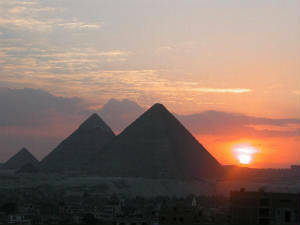 The Valley of Giza-- with its wonderful monuments-- is truly a marvel of architectural prowess. The three largest pyramids located in the valley consist of the Great Pyramid of Khufu, the Pyramid of Kafhre and the Pyramid of Menkaura. Each Pyramid is a tomb dedicated to a different king of Egypt. Unfortunately, like many of the great kings of the Old Kingdom of Egypt, the Pyramids of Menkaura, Khufu, and Kafhre were not finished by the end of each respective king's reign. As an example: in the case of Menkaura, the king died before its construction was completed. The monuments of Giza and the entire Giza Valley stand as a marvelous reminder of the skill executed in the creation of the pyramids, and are truly fabulous to see.